But recently, animals and hunting are all we seem to talk about in this house. 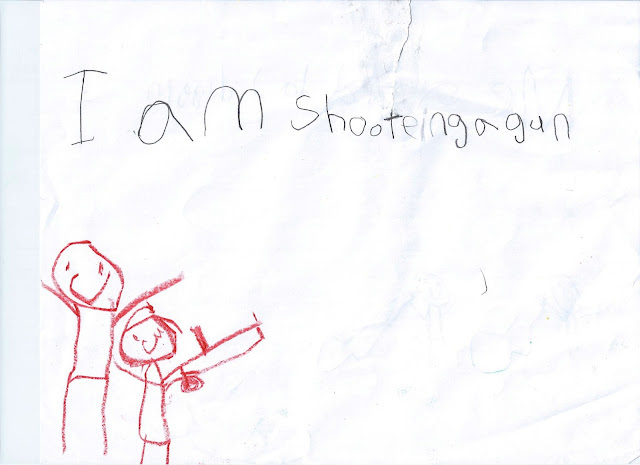 Jaymin shot his first gun this winter. And hasn't stopped talking about round two. Which is where he drew this picture. with the horrendous things that have taken place in our nation. 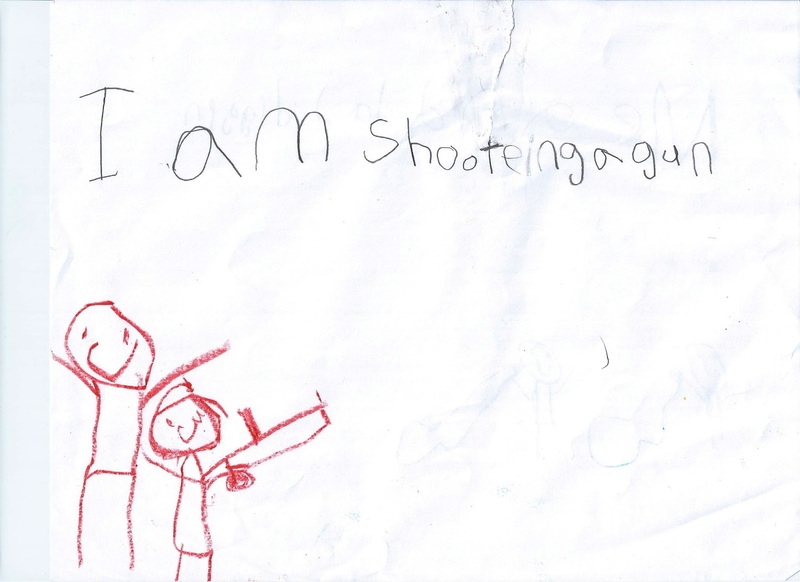 Thank goodness the teacher just told him he can't draw those pictures at school. I actually think its really cute. That's him and daddy, who helped hold the gun for him. as well as the animals he's hunting. And now he's teaching our boys the same. Here he is teaching me a little about ammo. ...still pretty lost. Just sayin'. Every night at dinner we play "the animal game". and every one else has to try to guess what it is. The more unique the creature the better! We also give hints such as, where the animal lives, is it a reptile, does it have fur, etc. 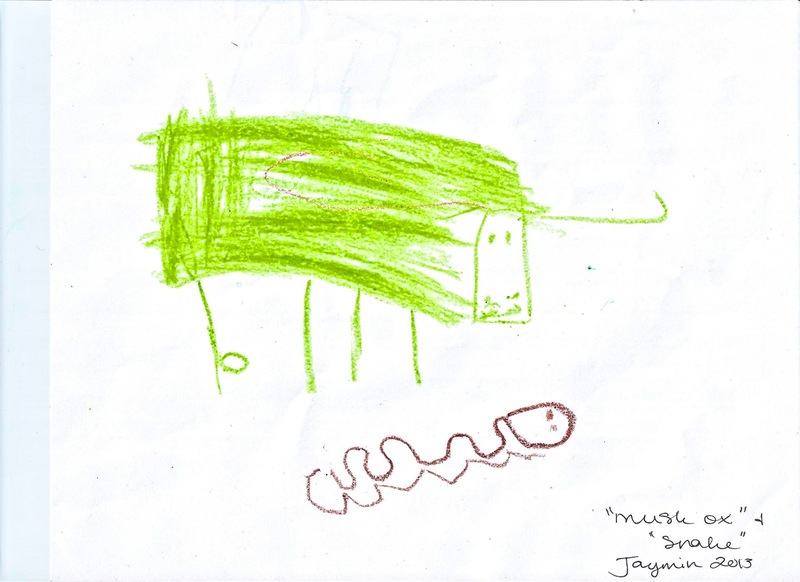 I love this picture Jaymin drew of a musk ox. I was pretty sure he was making that up. Turns out, its a real animal. The other day we were listening to "sic'em on a chicken" by zac brown band. so I was hoping the boys would miss it completely. Unfortunately, I hear Jaymin gasp and say "he just said a bad word!" Oh jeez, here we go. Before I could come up with a response he said "he just said a broken mason jar, mom, and I know how much you love them." Jett broke one of my brand new blue ones this past summer. And yes, I wanted to kill him. Just today Jaymin told me "grandpa said the 's' word." Again, before I could form a response, he said "he told Rusty (their dog) to shut-up!" love this post and the photos are beautiful! I am so thankful your school did not make a big deal about that. I know many schools around here have been CRAZY about the gun thing lately. That is great your husband is teaching them so much. My son is 13 now and he still loves animals. I remember when he was little and we talked about them all the time : ). Those are good memories!